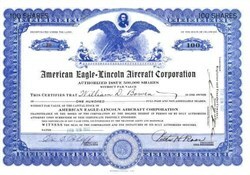 Beautifully engraved certificate #30 from the American Eagle-Lincoln Aircraft Corporation issued in 1932. This historic document was printed by W.N. Perrin & Company, Inc. and has an ornate border around it with a vignette of an eagle and Abe Lincoln. This item is hand signed by the Company's President ( Victor H. Roos) and is over 77 years old. The American Eagle Aircraft Corporation was started in 1925 by Ed Porterfield for the express purpose of providing a safe training aircraft for the fledgling Porterfield Flying School. Porterfield felt that a safer, better performing trainer was badly needed to replace the existing "Jennys" and Lincoln "Standards" being used in his flight school. In April 1926, the American Eagle, Model A-1, first flew from Richards Field in Kansas City, Missouri. The airplane had been designed by Waverly Stearman after much consultation with Porterfield concerning the characteristics necessary for a good training aircraft. It was a three-place, open cockpit bi-plane that was suitable for both training and light commercial activity and was typical of the era. In November, 1927, the OX-5 powered A-1 received an Approved type Certificate - ATC #17. Various changes were made to the original A-1 design (The most notable being the addition of ailerons on the lower wing.) leading to the A-101 designation. Most Eagles were powered with war surplus Curtiss OX-5 engines, but variations were available with the OXX-6, Hisso, Anzani, and others. During may of 1928, production was 12 planes per week with ever increasing orders. In mid-1928 an OX-5 powered A-101 sold for $2815. Approximately 300 of the A-1 / A-101 models were sold. In 1929, American Eagle brought out a new model, the A-129, which received ATC #124. The new model was very similar to the earlier "Eagles" except that it was powered by a 5-cylinder Kinner K5 engine which required a longer nose on the aircraft to maintain proper balance. This gave rise to the "Eagle" A-1 and A-101 versions being called "shortnose Eagles", and the A-129 Kinner powered model being called the "longnose Eagle" and other such names. The A-129 "Kinner Eagle" would not win any beauty contests, but it was stable and reasonably easy to fly. The A-129 was also sold with several other engine configurations including the OX-5 and OXX-6. During 1928 and 1929 business was booming for the American Eagle Aircraft Corporation and they produced several other aircraft in addition to the A-101 and A-129. None of these sold as well, but production of the A-201, A-139, A-229, A-329, A-429, as well as several prototypes, placed the company near the top of the vibrant aircraft industry. The stockmarket crash in late 1929 changed all that, and in 1930 the company found almost no market for its aircraft. In desperation, Porterfield started the design that eventually became the American Eaglet monoplane. It was a small, light weight, parasol design that was powered by a three cylinder Szekely radial engine. Although the "Eaglet" sold fairly well, the company was in trouble, and in May 1931, the American Eagle Aircraft Corporation merged with the Lincoln Aircraft Company. 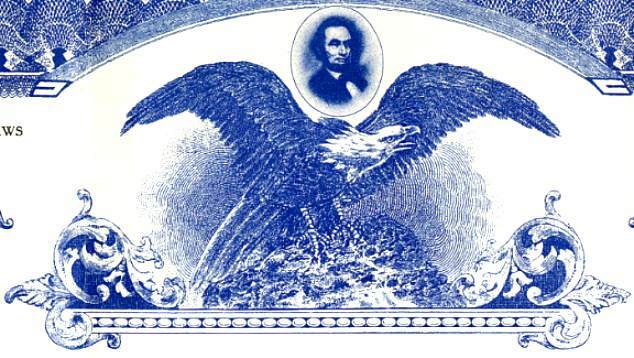 The new company was known as the American-Eagle-Lincoln Aircraft Company, and most of the production was focused on the "Eaglet". However, the deepening depression soon ended this last gasp of American Eagle. Ed Porterfield went on in later years to organize the well known Porterfield Airplane Company. During its six years in existence the American Eagle Aircraft Corporation produced over 700 aircraft and held eight Approved Type Certificates issued by the Department of Commerce. It was the third largest producer of commercial aircraft in the world at the time of the depression, and its products were among the finest private aircraft manufactured during that era. History from Wings of History Museum.